Lots going on this week: Playa Del Rey safe streets, rent control action, BKoB’s Freedom Ride, housing happy hour, BUSted!, walking tours in Bunker Hill and East Hollywood, and much more. Monday 7/24 – Tonight Abundant Housing will host a pro-housing happy hour from 6:30- 9 p.m. at The Arsenal at 12012 W. Pico Boulevard in West L.A. Details at Facebook event. Wednesday 7/26 – The L.A. City Council Transportation Committee will meet to discuss and vote on city transportation issues, including open streets, Warner Center, Lincoln Blvd, and more. The meeting takes place at 1 p.m. at L.A. City Hall Room 1010 at 200 N. Spring Street (public entrance on Main Street) in downtown L.A. Details at meeting agenda. Thursday 7/27 – Metro hosts its regular monthly board meeting. On the agenda this month are electric and natural gas buses, and much more. The meeting takes place starting at 9 a.m. at Metro headquarters third floor boardroom at One Gateway Plaza (behind Union Station) in downtown L.A. Details at Metro meeting website. Thursday 7/27 – Housing Now, ACCE, and the L.A. Tenants Union host the L.A. Day of Action to Repeal State Restriction on Rent Control. The groups have worked to rally families, workers, and landlords in cities across the state to take direct actions and to call for the repeal of Costa Hawkins. Meet at 10 a.m. at the corner of Lorraine and Wilshire Boulevards in Mid-Wilshire. Details at Facebook event. Thursday 7/27 – The LATCH Collective hosts James Rojas’ Community Planning Workshop from 7-10 p.m. at Los Angeles Eco-Village, at 117 Bimini Place in Koreatown. Details at Facebook event. Saturday 7/29 – Los Angeles Walks hosts its Forbidden City Walk exploring once-common building types like bungalow courts and dingbats that were outlawed or suppressed by changes to zoning and building rules. The walk starts at 9 a.m at the Vermont/Santa Monica Metro Red Line Station. For more info and to purchase tickets go to L.A. Walks website. 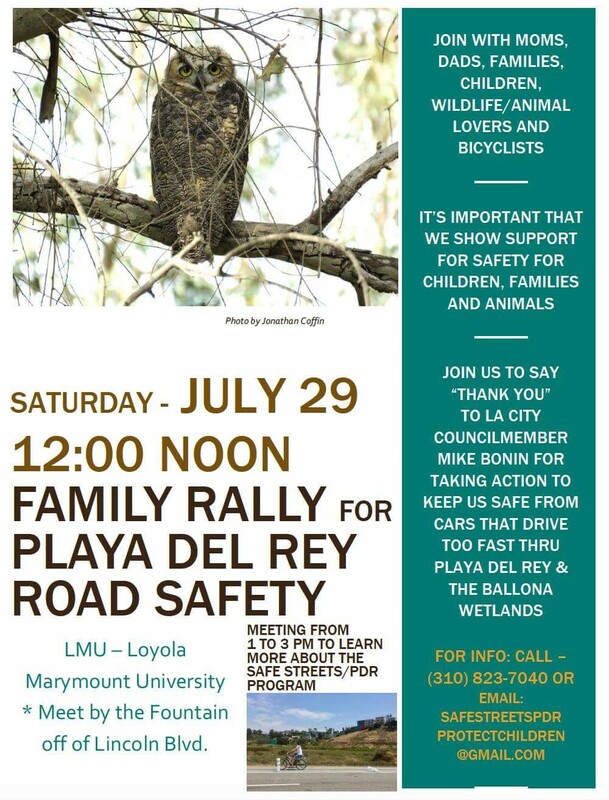 Saturday 7/29 – LADOT will host an open house meeting regarding recent safety improvements in Playa Del Rey. The event will take place from 1-3 p.m. at Roski Dining Hall, at Loyola Marymount University at 1 LMU Drive in Westchester. More details and RSVP at LADOT Playa Del Rey website. Proponents of the recent improvements are hosting a rally in their favor starting at noon by the fountain off of Lincoln Boulevard. Rally details at Facebook event. Sunday 7/30 – Black Kids on Bike will host Wrenching for the People: free bike tune-ups in Leimert Park’s People St Plaza at Leimert Park Boulevard and 43rd Place in South L.A. Tune-ups go from 10 a.m. until around noon, then ride out with BKoB on their monthly Freedom Ride at 1 p.m.. Details at Facebook event. Sunday 7/30 – The Los Angeles Visionaries Association (LAVA) hosts Old Bunker Hill & Cable Cars. The free walk event starts at 2 p.m. at Grand Central Market at 317 S. Broadway in downtown L.A. Details at LAVA website or Facebook event. Sunday 7/30 – BUSted! True Stories About Being Car-Free in L.A. returns to Stories Books and Cafe at 1716 W. Sunset Boulevard in Echo Park. From 5-8 p.m. hear real people telling their true stories about getting around L.A. by bus, subway, bicycle, by walking, horseback, hot air balloon – every way except for driving. Featured storytellers include LACBC’s Monique Lopez and CicLAvia’s Romel Pascual. Details at Facebook event. This week: Transportation Committee, Eastside Mural Ride, Rail-to-River, APBP Happy Hour, and SCAG Toolbox Tuesday.